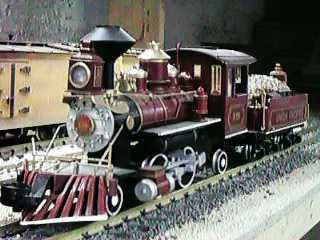 The Bachmann 2-4-2 Columbia is a small engine modeled to look like an old western wood burning engine. There was another version manufactured that was a coal burner. Actually, neither follows a real prototype very closely. The closest prototype engine was a cane field loco that was built by Baldwin and ran in Hawaii. This engine should not be confused with the Bachmann Spectrum Line 2-4-2T which is a much newer and more capable engine. The 2-4-2 Columbia type got its name because one of the first ones manufactured was exhibited at the World's Columbian Exposition at Chicago in 1893. The engine type was generally not very successful and not many were built. The 4-4-0 American and 4-6-0 Ten Wheeler types tracked better at speed due to their 4 wheel leading truck and the 2-6-0 Mogul type was generally bigger and provided better traction in freight service due to more weight and six drivers. The Columbia was just too small to take advantage of the larger firebox that the trailing truck allowed. The real advantage of the trailing truck was realized in the larger Atlantic, Pacific and Mikado class engines. True to its prototype heritage, the model isn't very successful either. Of all the large scale engines that I have come across, none tracks or pulls more poorly that this model. It is my understanding that this version of the engine is no longer in production. The engine does have a kind of a "cute" look to it and since it does actually run, it deserves the attention that it takes to make it marginally useful. 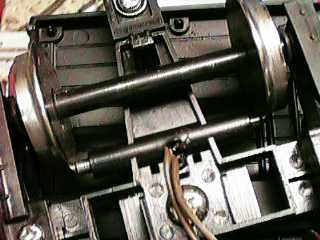 The engine, especially the leading truck, has a tendency to derail often, especially over turnouts. There is really little that can be done besides checking and setting the leading and trailing truck gauge. There is not enough clearance above the truck to add much weight to the trucks, but 1 oz of stick on HO type weights does help some. 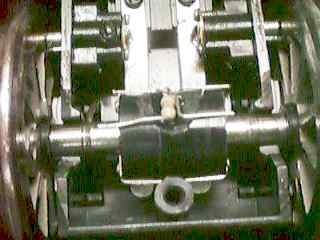 Shimming the drivers also helps keep the frame in line and helps to minimize derailments. This also works on the 4-6-0 Big Hauler. The shimming method can be found in the Big Hauler Tips Page. The gearing method used in the Columbia is similar to the early model Big Haulers. However, the gearing is less likely to get mangled simply because the engine pulls so poorly that little stress gets applied to the gears. Two or at most three cars is about all this little engine can handle even on light grades. On a 5% grade, one car is about it. When I first got my Columbia many many moons ago, it ran terrible. It jerked badly and had awful gear noise. I finally got so tired of it that I sent it back to Bachmann with $20 to get it repaired. Bachmann was good to their warranty and when the engine came back, it had a new bottom end. It ran very quietly and smoothly. The difference was astounding. It still didn't pull worth a hoot, but at least it was usable. The Columbia suffers from flaky power pickup, just like its bigger brother, the 4-6-0 Big Hauler, and for all the same reasons. The spring loaded power contacts crap out, but not as badly as on the Big Hauler because the engine draws less current and the contacts don't heat as much. The fixes are the same as for the Big Hauler, either remove and rebuild the contacts or substitute LGB contacts for them. The driver lateral play can allow the drivers to move away from the contacts enough so that they no longer touch the backs of the drivers. Shimming the drivers solves this problem. The wheels get dirty easily and do require cleaning more often that I would like. The pony trucks are wired to pick up power but, as with the Big Hauler, the bearings don't transmit power very well. Besides lubricating the bearings with conductive oil, there is not much that can be done with them. The tender trucks on the Columbia have pockets molded in them that accept LGB power pickups. By installing metal wheels and wiring power contacts to the engine, a significant improvement in power pickup reliability can be realized. However, this improvement comes at the cost of increased drag which this little engine can ill afford. The tender trucks take small wheels. I used Gary Raymond 33" wheelsets. Dean Lowe also makes wheels that will fit. With the trucks disassembled, drill out the plastic wall between the adjacent pockets with a drill a couple of sizes smaller than the pockets. Then use the same drill to drill through to this new passage from the outside. Solder small flexible wires to each contact and thread the wires into the pocket and out the new center hole. Reassemble the truck and wire the new contacts to the engine. The trailing truck is a convenient place to connect to the engine by soldering wires to the existing wheel bearings. The sound system in the Columbia is identical to the Big Hauler sound system. The Better Bachmann Sound For About A Buck page describes modifying the sound in a Big Hauler. All of the modifications described there are entirely applicable to the Columbia. However, since the drivers on the Columbia are much smaller than on the Big Hauler, making the 4 chuff modification may make the engine chuff entirely too fast unless you like to run fairly slowly. There is one complication on the Columbia that doesn't exist on the Big Hauler. The sound drum is so close to the front mounting post for the bottom cover that the resistors won't fit without modifications to the drum. I cut grooves into the drum with a motor tool to recess the resistors and glued them on with ZapCA. Like some Big Haulers, the wire that leads between the engine and tender that connects the sound system gets stiff with age and will often pull out if its socket. I just replace the wire with a piece of very small zip cord. Disassembly of the connector can be a challenge, but it can be done by using a sharp tool to depress the metal clips that hold the contacts in the connector shell. Smoke. The Columbia is not equipped with a smoke generator and the stack (on the wood burner at least) is too small to accept an LGB smoke unit. Front Coupler. The front coupler on the Columbia is just a dummy unit. Even with a functioning coupler it would be fully useless as the front overhang on curves is too great. Pilot. The pilot on my wood burner hung too low and caught on the track often. I've modified the pilot support rods to pull the pilot up higher so that it will clear normal obstacles. I've seen reports that Bachmann is still producing an updated version of the Columbia. From the reports on LSOL, the newer engine has a completely redesigned gear train. The motor now sits vertically instead of horizontally behind the rear axle. The reports also indicate that the engine pulls better than mine and has a smoke unit. Externally, the model appears to be similar. If you see one cheap, it might be a deal.